Fully immerse yourself in your favorite music while enjoying the rejuvenating waters of your spa. 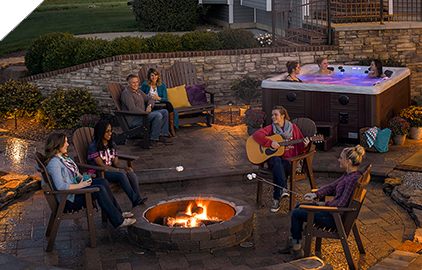 The Fusion Air Sound System, an available option on all Twilight Series Hot Tubs, is a vibrant stereo system built directly into your hot tub. Controlled entirely by the spa control touch pad, the set includes two topside speakers mounted near the headrests for peaceful, uninterrupted listening. To further amplify your experience, the sound system includes a subwoofer, a feature that deepens the bass and treble audio to maximize sound quality. 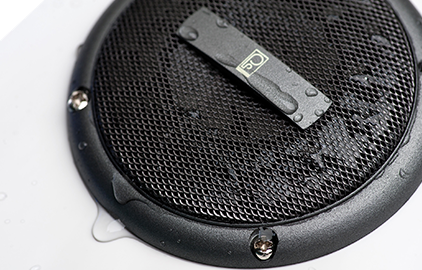 The built-in marine-grade spa speakers are designed to withstand all weather types, rain or shine. 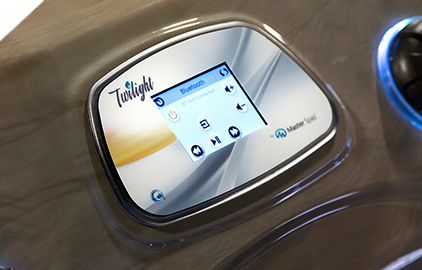 From the convenience of the water-resistant touchpad controls, Bluetooth® wireless streaming and FM radio capabilities, to the perfect placement of the speakers, it’s easy to select your music and set the mood. With the addition of a waterproof case and mount accessory, you can even connect your tablet and stream the latest movies and television shows over the sound system, turning your hot tub into a "cinematic" experience.